The round shape of a new species of fossil turtle, reported July 11, 2012, and found in Cerrejon coal mine in Colombia, would have meant more surface area to be warmed by the sun. In Japanese mythology, the tortoise supports the ‘Abode of the Immortals’ and the ‘Cosmic Mountain’, where the Cosmic Mountain relates to the axis mundi – the world axis. Above turtle relief from the 9th-century Mahayana Buddhist Temple in Magelang, Central Java, Indonesia, consisting of six square platforms topped by three circular platforms thought to have been founded around 800CE at the peak of the Sailendra dynasty when it was under the influence of the Srivijayan Empire (Malay empire in Sumatra) which had close relations and interactions — and often rivalries — with neighboring Java, Kambuja and Champa. In nearby Bali, the Hindu influence is more prominent, where the turtle or tortoise is itself a sacred animal for Balinese Hindus, representing the Kurma Avatar or Bedawang Nala (Wisnu’s incarnation as a giant turtle supporting the world). Sea turtles are valued as sustainers of life on earth. Turtle meat was traditionally used as offerings during the religious ceremonies and a few Hindu ceremonies customarily also used a turtle head as a part of the offering, symbolizing the base of the world. Following conservation efforts, however, turtle meat consumption was reduced and the real turtle head offering replaced with symbols such as a drawing of a turtle or a turtle-shaped rice cake. In the Hindu scriptures, the turtle/tortoise is a solar symbol and the great sage Kasyapa (Sanskrit for tortoise) is the father of Aditya, the Sun. The story of the Historical Buddha’s birth as a tortoise (in his past lives, before becoming the Buddha) is featured in Indian reliefs of the first gallery balustrade, where a total of five panels present the culminating scenes from a story called the Kaccapavadana. Kasyapa is particularly appropriate representation for a past life of the Sakyamuni, who was sometimes called the “Kinsman of the Sun” (Adityabandu). The Devas lost their strength and powers due to a curse by the sage Durvasa because Indra, the king of the Devas, had insulted the sage’s gift (a garland) by giving it to his elephant (Airavata) which trampled upon it. Thus, after losing their immortality and kingdom, they approached Lord Vishnu for help. Vishnu suggested that they needed to drink the nectar of immortality to regain their lost glory. However, they needed to strive hard to acquire the nectar since it was hidden in the ocean of milk. After declaring a truce with their foes (Asuras), Indra and his Devas together with the Asuras, use the serpent Vasuki as a churning rope and the mount Mandara as the churning staff. When they began churning, the mount began sinking into the ocean. Taking the form of a turtle (Kurma), Vishnu bears the entire weight of the mountain and the churning continues. Fourteen precious things come out of the ocean, culminating with Dhanvantari, the physician of the gods, appearing with the nectar of immortality. The Asuras immediately rush and grab the nectar while quarrelling among themselves. Vishnu again comes to the rescue in the form of a beautiful damsel, Mohini and tricks the Asuras and retrieves the potion which is distributed to the Devas. Though the Asuras realize Vishnu’s tricks, it is too late, as the Devas regain their renowned prowess and defeat them. The Yoruba of Africa (Y-DNA E1b1) developed a divination system called Ifa that used tortoise shells as an oracle. The Chinese are well-known for their ancient divining system or pyro-osteomancy (which was also practised in Japan since the Yayoi period) known as the Tortoise Oracle. The earliest pyro-osteomancy in China using turtle plastrons (shells) as well as the bones of sheep, deer, cattle, and pigs, was known from prehistoric east and northeast Asia… uncovered in especially abundant numbers from archaeological sites from the Shang Dynasty in China. The site of Anyang had over 10,000 of these objects, primarily ox shoulder blades and turtle shells carved with archaic forms of Chinese characters, used for divination between the 16th and 11th century BC. One early method of divination was to heat animal bones in a fire and study the cracks that appeared; another method was to interpret the markings on tortoise shells. Such methods were probably employed to consult about affairs of state, fortunes of war, proposed marriages etc. The Vedic culture is now considered (see the Quest for the origins of Vedic culture” the by-product of an invasion or migration of “Indo-Aryans” from outside the subcontinent. The creator goddess Nüwa (or Nukua) cut the legs off the giant sea turtle Ao (鳌) and used them to prop up the sky after Gong Gong damaged the Buzhou Mountain that had previously supported the heavens. In Chinese culture, especially under the influence of Taoism (道教) the tortoise is the symbol of heaven and earth, its shell compared to the vaulted heaven and the underside to the flat disc of the earth. The tortoise was the hero of many ancient legends. It helped the First Chinese Emperor to tame the Yellow River, so Shang-di rewarded the animal with a life span of Ten Thousand Years. Thus the tortoise became a symbol for Long Life…which is likely why stone grave steles on a stone tortoise are commonly found or tomb objects seen in China-Mongolia, Korea and Japan. The tortoise is also regarded as an immortal creature. This probably indicates the symbolism of rebirth and regeneration cycle of life. The Dark Lord of the North, Xuan Wu (Xuan Wu Da Di) is a deity that comes from the prehistory of shamanic times (c. 6000 BC). In relatively modern Chinese prehistory (c. 1200 BC) the Dark Lord has become the human figure of a warrior with wild, unruly black hair, dressed in the primitive clothing of the tribal peoples of Neolithic times. He is powerful and strong deity capable of powerful punishments and redemptive deliverance. He is frequently depicted as the black tortoise who rules over the direction North in Chinese cosmology. He is called ” Xuan” for the color black and ” Wu” meaning “tortoise. “The tortoise has frequently been associated with the art of divination and is often credited with bringing to us the trigrams of the I Ching and also the idea of the Lo Shu magic square, which is much used in Feng Shui as well as in mystic sciences and sacred geometry throughout the world. The tortoise is sometimes known as the ‘Dark Warrior’ and in this role its qualities are seen as strength, endurance and regeneration. Its inanimate shell represents the lifeless rock that is acted upon by the elements of nature and by divine inspiration (the breath of the heavens) to produce life. This scenario is dramatised in the novel ‘A Journey to the West’ where Monkey (and by analogy humanity), is born as the Stone Monkey, from an egg shaped rock. Thus born into the light, he must become a warrior and encounter his dark or shadow side. Another Chinese legend tells of how a family were trapped within a cave and were able to survive for many hundreds of years (yes – hundreds), by observing and copying a tortoise that was trapped in the cave with them. 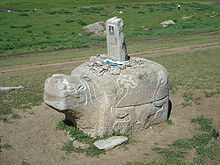 Above a Mongolian stele stands on the back of stone tortoises similar to those found around the capital of the Mongol Empire Karakorum. The Korean (and Japanese) turtle tomb guardian genbu are likely derived from both the Indian and Chinese Shang dynasty myths. The turtle is one of their oldest, most sacred symbols. They believed that North America was created on the back of The Great Mother, a turtle. The turtle’s shell resembled a dome and was seen as a symbol of the dome of heaven -hence heavenly virtue. The turtle was carved and worn as a talisman for longevity and power over all forms of bad magic. In Sonora, northern Mexico, one of the ancient prehistoric burials excavated included a turtle shell on the individual’s chest. In classical mythology the tortoise is sacred to both Aphrodite (Venus) and Hermes (Mercury), two deities associated with sexuality. It has been suggested that one reason for this association may be the action of the tortoises head as it extends and retreats from its shell. Here again we see a connection fertility and with procreation. Aesop, the Greek slave famous for his fables, tells us that the tortoise got its shell after declining an invitation from Zeus, with the excuse that, “There’s no place like home”. The response angered Zeus so much that he made the tortoise forever carry around his home. Despite this handicap, in another well known fable (associated with the loss of the gift of immortality from the gods), the tortoise is victorious in a race with a hare, proving that slow and steady can arrive first. 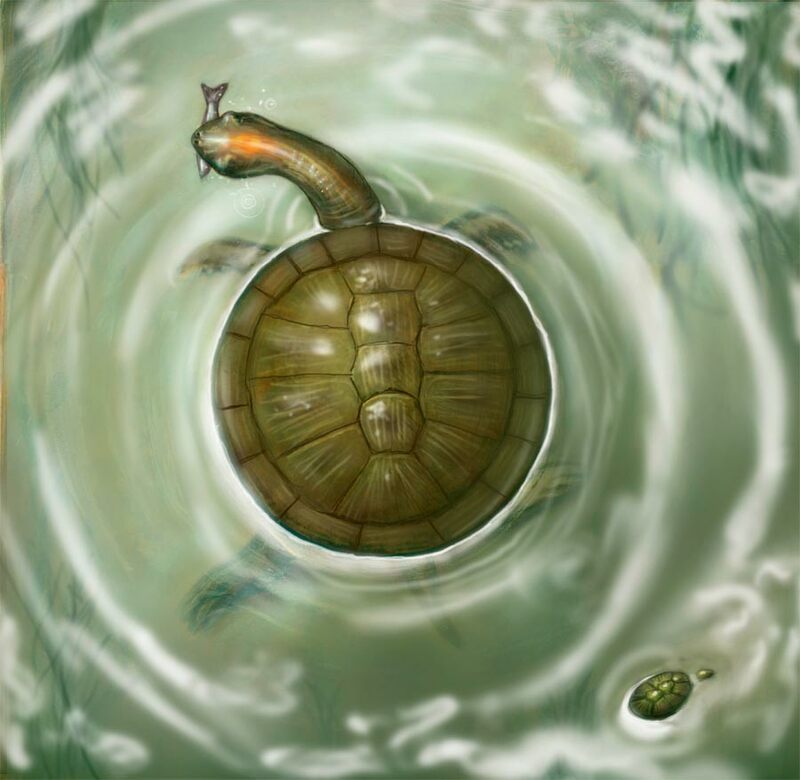 What is the symbolism of the turtle? The Architectural Foundation on the Guifu Hill in the Zuling Mausoleum Precinct of the Liao Dynasty in Bairin Left Banner, Inner Mongolia.